AVAILABILITY & PRICINGThe ASUS ZenFone 4 Pro ZS551KL-S835-6G64G-BK is immediately available at a MSRP of $899 at Amazon.ca, Best Buy Canada, Memory Express, Newegg.ca, and and other leading retailers. The ASUS ZenFone 4 ZE554KL-S630-4G64G-BK (Midnight Black) is immediately available at a MSRP of $549 at Amazon.ca, Best Buy Canada, Staples, Memory Express, Newegg.ca and other leading retailers. The ASUS ZenFone 4 ZE554KL-S630-4G64G-WH (Moonlight White) is immediately available at a MSRP of $549 at Amazon.ca, Best Buy Canada, Memory Express, Newegg.ca and other leading retailers. The ASUS ZenFone 4 Max 5.5” ZC554KL-S430-3G32G-BK (Deepsea Black) has been available since September at a MSRP of $299 atAmazon.ca, Best Buy Canada, Staples, Canada Computers, Memory Express, Newegg.ca, and other leading retailers. The ASUS ZenFone 4 Max 5.2” ZC520KL-S425-2G16G-BK (Deepsea Black) is immediately available at a MSRP of $229 at Amazon.ca, Best Buy Canada, Staples, Memory Express, Newegg.ca, and other leading retailers. So, if you're tired of just the major OEMs and want to stand out from your friends, getting something that's not Samsung or LG or Apple is a way to do it. These days there are a lot of manufacturers making great phones with competitive specs and prices. One of the options is from Asus, and I've reviewed the ZenFone 3 series (really loved that Zoom model). They announced the ZenFone 4 family recently, and they're now available in North America. Now, the only thing is the links I've tried (see below) for the availability and pricing have been only working if I'm in the USA. Try the Canadian counterpart of Newegg and it says it's out of stock (yet try to search newegg.ca for the listing and you can't find it). So, maybe we just need to wait a bit longer. Either way, They're a pretty good option, won't break the bank and there's a 6GB RAM option in there. Nice! Check out the press release below for more details on the 4, 4 Pro and 4 Max (in 2 different sizes) for pricing and specs. Fremont, CA (October 30, 2017) — ASUS today announced the availability of the ZenFone 4 family in North America: the ZenFone 4 Pro, ZenFone 4, and ZenFone 4 Max. The ZenFone 4 family is the first family of smartphones to all feature dual rear cameras, enabling users to capture the best photos in any scenario, at any distance, and in any lighting conditions. Combined with ultra-fast connectivity, users can instantly share their beautiful photos with friends and family, and enjoy using all of their favorite apps and services with unprecedented speed. The 5.5” ZenFone 4 Pro was engineered to deliver an unparalleled mobile photography experience. The ZenFone 4 Pro features an advanced dual-camera system designed to take mobile photography to new heights. Its main camera is equipped with the Sony® IMX362 image sensor with a large 1/2.55-inch size, 1.4µm pixels and a wide, f/1.7-aperture lens to capture brighter and clearer photos in low light. The dual-camera system on the ZenFone 4 Pro also has a 16MP camera with a 2X optical zoom and a 10X total zoom that brings distant subjects closer, putting them in sharp focus while softening background details. 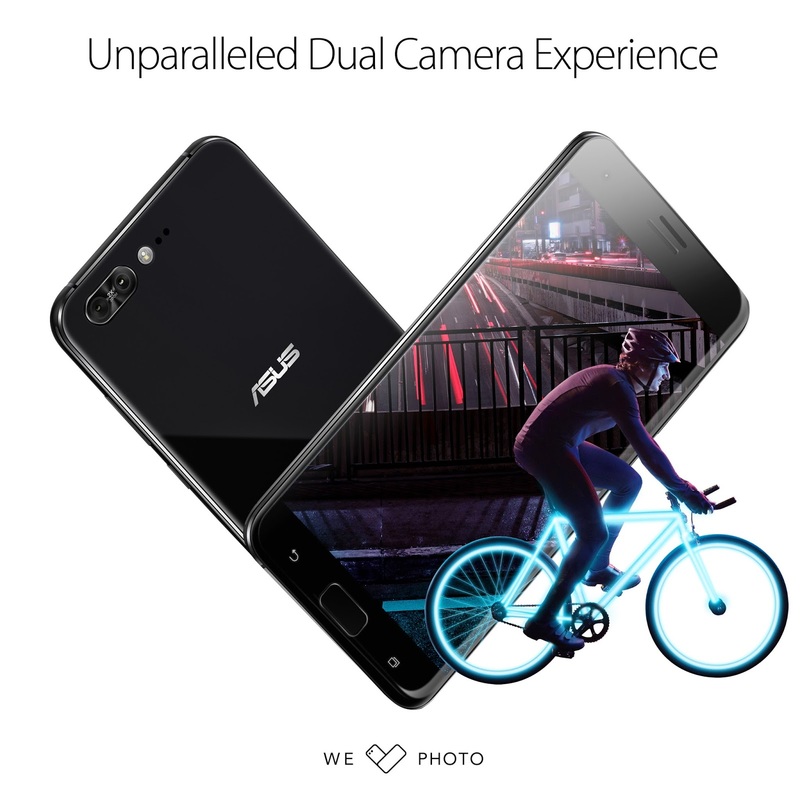 Together with the ASUS SuperPixel™ Engine that effectively increases captured light by up to 8X, and optical image stabilization (OIS) that enables blur-free handheld exposures of up to 1/4 seconds, the ZenFone 4 Pro captures sharper, brighter and clearer photos at night and in low-light environments. The ZenFone 4 Pro is built on the latest Qualcomm® Snapdragon™ 835 Mobile Platform, which is designed to deliver powerful performance, while the Qualcomm Spectra™ 180 ISP is designed to support vibrant photos and videos, and the Qualcomm Adreno™ 540 GPU is engineered to provide superior performance for high-end mobile gaming. The ZenFone 4 Pro also features an integrated Snapdragon X16 LTE modem for connectivity up to 600Mbps — indoors and on the go, as well as multi-gigabit 2x2 802.11ac Wi-Fi with MU-MIMO for a robust Wi-Fi experience. With the ultra-fast connectivity, users will be able to download and share 4K UHD videos in seconds, sync their photos, videos and other files almost instantly, enjoy delay-free VR, access to cloud and more, both indoors with 802.11ad Wi-Fi and on the go with LTE. Moreover, the built-in portable Wi-Fi hotspot lets users share LTE connectivity with other mobile devices such as laptops. 802.11ad Wi-Fi ensures that these devices can utilize the LTE connectivity even in crowded places such as airports. Built-in NFC enables convenient mobile payments with Android Pay™, and a front-mounted live fingerprint reader offers improved security and fast phone unlocking in just 0.3 seconds. To help prevent unauthorized use, the ZenFone 4 Pro has an advanced, extra-secure live fingerprint sensor. A capacitive sensor detects fingerprint details in the usual way, but there's an additional infrared optical sensor that detects blood flow under the skin. The ZenFone 4 Pro is available in Pure Black. The 5.5” ZenFone 4’s dual-camera system features a main camera with the Sony IMX362 image sensor and a large, f/1.8 aperture lens that offers incredible low-light performance to let users capture gorgeous photos at night or indoors, as well as a 120° wide-angle lens that enables users to fit more scenery and people in the frame for dramatic photos and videos that capture an expanded view. Powered by the latest Snapdragon 630 Mobile Platform, the ZenFone 4 delivers fast yet energy-efficient performance for every scenario, and a high-capacity 3300mAh lithium-polymer battery and ASUS BoostMaster fast-charge technology means less charging and more moving. The ZenFone 4 also features 4GB of RAM for improved performance and the Adreno 508 GPU is designed to deliver 30% faster graphics performance than Snapdragon 626 for smooth and responsive experiences with the latest apps and games. The ZenFone 4 also features a quick 0.3 seconds fingerprint sensor and NFC, enabling the convenience of Android Pay, and is available in both Midnight Black and Moonlight White. The ZenFone 4 Max smartphones are designed to be the perfect all-day photography companions, featuring a dual-rear-camera system with a 13MP main camera and a 120° wide-view camera. The ZenFone 4 Max comes in two different sizes. The ZenFone 4 Max (ZC554KL) features a 5.5-inch display and a high-capacity 5000mAh battery with ASUS PowerMaster technology for an incredible 46 days of 4G standby time. The ZenFone 4 Max (ZC520KL) features a 5.2-inch display with a fast-charging 4100mAh battery for up to 37 days 4G standby. With its massive battery power, the ZenFone 4 Max smartphones can double as a power bank to charge other devices, supplying 5V at 1A to attached devices when using a USB On-The-Go (OTG) cable (sold separately). While charging other devices, the ZenFone 4 Max monitors its own charge level and will not allow the battery to drain below 30% capacity to ensure that users will be able to continue using their phone. The ZenFone 4 Max smartphones run on the powerful, yet energy-efficient Qualcomm Snapdragon 430 and 425 Mobile Platforms that work in concert with their high-capacity batteries to give users ample power for a full working day and beyond. The Qualcomm Adreno 505 and 308 graphics processors further enhance performance and responsiveness, and enable the ZenFone 4 Max smartphones to run the latest games. The ZenFone 4 Max smartphones also support 4G LTE Category 4 for ultra-fast mobile download speeds up to 150Mbps. The ASUS ZenFone 4 Pro ZS551KL-S835-6G64G-BK is immediately available at a MSRP of $599 USD at the ASUS Store, Amazon, B&H, Best Buy, Newegg, and other leading retailers. The ASUS ZenFone 4 ZE554KL-S630-4G64G-BK (Midnight Black) is immediately available at a MSRP of $399 USD at the ASUS Store, Amazon, B&H, Best Buy, Newegg, and other leading retailers. The ASUS ZenFone 4 ZE554KL-S630-4G64G-WH (Moonlight White) is immediately available at a MSRP of $399 USD at the ASUS Store, Amazon, B&H, Newegg, and other leading retailers. The ASUS ZenFone 4 Max 5.5” ZC554KL-S430-3G32G-BK (Deepsea Black) has been available since September at a MSRP of $199 USD at the ASUS Store, Amazon, Newegg, and other leading retailers. The ASUS ZenFone 4 Max 5.2” ZC520KL-S425-2G16G-BK (Deepsea Black) is immediately available at a MSRP of $169 USD at the ASUS Store, Amazon, B&H, Best Buy, Newegg, and other leading retailers.